Hair loss or baldness is usually caused because of genetics (inherited tendency), disease, medications, stress, injury or damage to the hair. Generalized hair loss is termed Alopecia whereas small, circular bald patches are termed as Alopecia Areata. 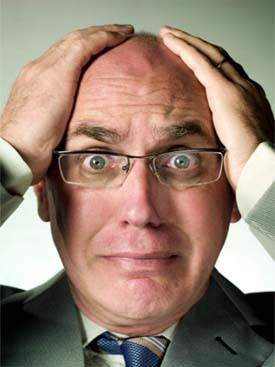 Alopecia barbae is also one of the types of alopecia, it causes some men to experience bald patches in the beard area. The two conditions have been clubbed here together because of similarity of symptoms, and the Ayurvedic principles of treatment for both are described here. It is noteworthy to mention here that treatment is usually effective for premature hair loss, and where the cause is amenable to treatment. In Ayurveda, baldness is termed as "Khalitya" in Ayurveda. Alopecia areata is termed as "Indralupta". Ayurvedic herbal treatment is aimed at treating known causes, immuno-restoration, treating the local scalp condition and reducing stress. Medicated oils are used for local application. Some of the commonly used oils are: Vranashodhan oil, Bhrungraj (Eclipta alba) oil, Amalaki (Emblica officinalis) oil, Brahmi (Bacopa monnieri) oil, Jaswand (Hibiscus rosa-sinensis) oil, Vatajatadi oil and Bhallatak (Semicarpus anacardium) oil. Some Ayurvedic physicians use leech therapy at the bald spots before using the above mentioned local medications. Some advise a course of enemas of medicated milk (called as "Tikta-Ksheer Basti") in conditions of extensive hair loss. Some medicines which are used orally are: Arogya Vardhini, Gandhak Rasayan, Laxadi Guggulu, Rasayan [ a combination of Gokshur(Tribulus terrestris), Amalaki (Emblica officinalis) and Guduchi (Tinospora cordifolia)]. Ayurveda believes hair to originate from the "Asthi" or bone tissue, and therefore, to treat hair loss, medicines to strengthen bone are given orally on a long-term basis. Some medicines used for this purpose are: Pancha Tikta Ghruta, Mahatikta Ghruta, Praval Panchamruta, Laxa and Asthishrunkhla (Cissus quadrangularis). Milk and black gram are advised for consumption in large quantities. Medicines like Brahmi (Bacopa monnieri), Jatamansi (Nardostachys jatamansi), Shankhapushpi (Convolvulus pluricaulis) and Vacha(Acorus calamus) are given orally to reduce stress. It is believed that regular application of medicated oils in the nose (a procedure called "Pratimarsha Nasya") has an important role to play in preventing premature baldness and graying of hair. Anu oil and Panchendriya Vardhan oil are usually used for this procedure. I have an alopecia areata for 5 years.. Is it any cure for it.. I am Male 28. From past 2 years.front side of My hairs becoming thin and dry.Before that i am having thick and full hairs.but know front side only i am losing my hairs. Please help me. dr. ke puchane ke bad alopecia bata raha hai.iska koi elag bataye. pl help me sir. thank you. sir my name is anil i am from anantapur andhrapradesh(state) if you give me a permanent solution for alopecia(penukorukudu)at mustache. i am suffering from last oneyear when i will take treatment it will cure when i stop treatment it will come. sir mera ladka jiski age 7 saal hai ...uske sar mai do..teen jagha se gol..gol bal ud rahe hai ..sir koi upchar batae..danyvaad..